by Matt Dowsett. Photo Iñaki Vergara. It is a very human trait to want to be respected, to be highly knowledgeable and to elevate oneself, not only within a social circle, but far beyond. Some would argue that it is innate; linked to our evolution and the limbic system – that part of the brain that primarily integrates emotions, motivations and behaviours. Darwin maybe would have argued that it is actually in our genes as it ensures that the elevated ones are sure to get the girl, to get fed. Little wonder that we strive for eminence when, deep down, we believe it will give us power. But remember that true eminence is not just about being well known. It is possible to become well known overnight; that is fame. It is also not just about having great knowledge. It is possible to attain great knowledge through the application of ones own appetite; that is being learned. True eminence is about being respected for ones knowledge and experience, being well known for it and, as a result, having influence. Seeking to advance oneself is always a dangerous game. The temptation to cut corners, cheat a little or even to walk over the bodies of rivals to advance is never far away. Beware that a person is never too high to fall, but more than that, reputation is a valuable treasure that is easily lost. As Baltasar Gracian said: “A single lie destroys a whole reputation of integrity.” Elevate, go and climb higher, but remember “The high road is always respected. Honesty and integrity are always rewarded.” (Scott Hamilton). Additionally, Nicholas Chamfort pointed out that: “Eminence without merit earns deference without esteem.” Anyone seeking this level should expect to have a long wait and be prepared to put in the effort. But they also need to be careful. “Knowledge can be heady stuff, but easily leads to an excess of zeal – to illusions of grandeur and a desire to impress others and achieve eminence… Our search for knowledge should be ceaseless, which means that it is open-ended, never resting on laurels, degrees or past achievements.” So wrote Hugh Nibley, perhaps warning against hubris and its results. In the world of fiesta and the encierro, there are plenty that seek an exalted position, despite there being few formal roles. The collective has no appointed leaders or positions of authority and yet many are drawn into the contest to become known, to become respected and to be seen as a figurehead for the masses in fiesta. Newcomers will attempt do demonstrate just how much they know about the history of fiesta. Perhaps they will even write a book, a blog or an article. 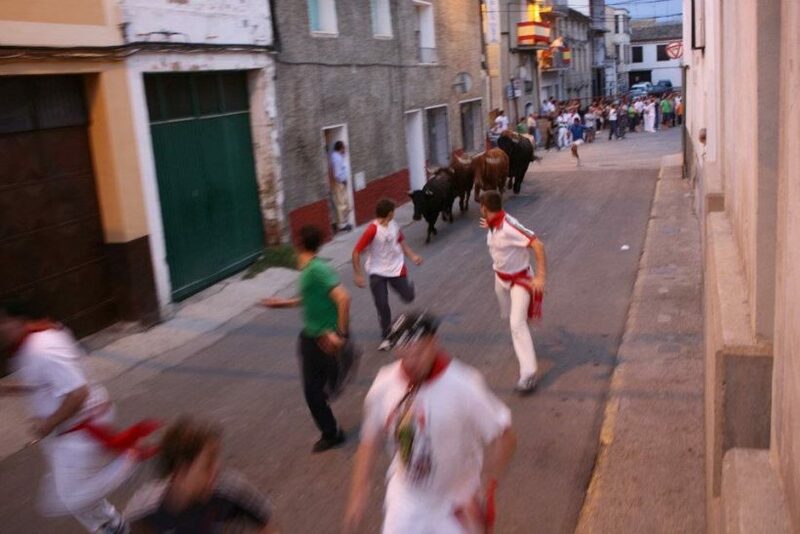 Others will try to make their name in the encierro and gain respect through that route. Some will simply opt for longevity; returning to fiesta year after year until they naturally assume a position of respect. Yet none of this is guaranteed to result in eminence. The person who returns time and again to Pamplona may be respected but could simply have lived the same fiesta thirty times over and never learned anything outside of the few bars and streets that they frequent. In the encierro the camera lies and a runner can make it look as though they have had an amazing run, eventually the truth will out. Not only that but respect in the encierro comes from proving oneself not just day after day, but year after year, as Nibley inferred. Even after all of this, status in the encierro can lead to a false sense of importance. To be regarded as “divino” or divine carries a number of connotations; being so elevated as to be considered saintly, having reached a pinnacle of performance that leads to the runner being beyond reproach, but also a sarcastic or mocking term for a runner who believes themselves to be worthy of this status. To be divino is not necessarily something to aspire to. The divino who challenges the gods of the encierro can soon encounter nemesis in “valiente” form. The search for eminence is at odds with the loose and chaotic nature of fiesta. In the maelstrom of Los Sanfermines, wielding power is contrary to the spontaneous, raw alegría. It inhibits it, it seeks to work against it in setting rules in an arena where the suspension of rules has long been celebrated as a cornerstone of fiesta. And what are these cornerstones? It could be argued that the key elements are faith, brotherhood, music, food and liberality. These do not leave much room for power to be assumed and employed, except perhaps in the world of faith. Look at the street during fiesta and you will see the evidence of the removal of controls: no or very few police or officials, the people spilling out onto the road, a huge and unmanageable mass allowed to be self-regulating, a 24-hour life, spontaneous bursts of music and dancing, a largesse that the city bathes in. This is no place for power except that which is confined to pockets of friends or collections of the like-minded. It is a deluded kind of power as there is no real effect. The scale of San Fermín repels power leaving those who desire it to scratch out their exposure where they can: on snatched television interviews, holding court in a bar or restaurant, online activity and the written word that rapidly becomes litter, floating around the dirty streets. Some will tell you that the best parties in San Fermín are the exclusive ones, invitation only, in character-laden apartments of the old town and frequented by aficionados and their groupies every year on a certain day of fiesta. Actually the true joy of fiesta comes from diving into the swirling whirlpool of humanity and letting the flow take you with it. 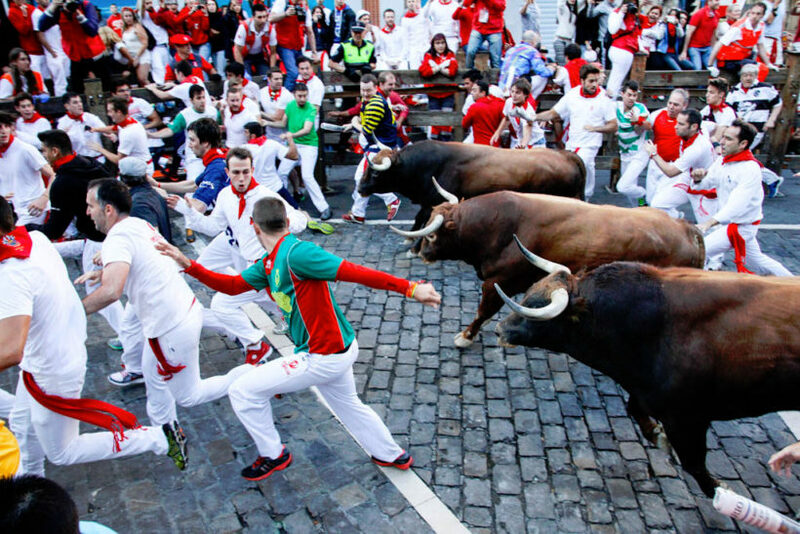 The white and red of Los Sanfermines may seem to some like an inhibiting uniform or a banal lack of individualism, but it is actually to be envied. The anonymous spirit can ignore all expectations and simply surrender to the flow. Power and influence come with shackles, while ignorance is bliss. How many long-term fiesta luminaries yearn to return to the fiestas of their youth? Not only to be young again, but to be free again – free of the responsibilities, burdens and expectations that come with age and influence. The faceless power of the collective alegría is stronger than the individual who has worked for 30 years to be respected on the street. Up on the balcony of the Casa Consistorial at 11:55 on 6th July, a line of the powerful and influential stand in their pristine white clothes. In their hands a petite glass of cava. On the face of it they are the great and good of the city, the region, but in reality they carry only grey eminence. The masses do not care about them; in fact they regularly jeer at them, chant rude songs and even throw things at them. Up on the balcony it is all polite and careful conversation as they observe the seething mass below on the plaza. The crowd swirls and surges, the joy is about to explode into rapture while the eminent and influential look politely on. “Isn’t it a marvellous view from up here,” observes one politician. “You are what you share”, Charles Leadbeater. A few years ago I went alone to Navarra in September to photograph the fiestas and to run a few encierros while I was there. Staying on the edge of Pamplona my morning drive daily took me south and west to Peralta, Olite and other typical Navarran towns where the fiestas come later in the summer. It was a colourful but sober week as I took hundreds upon hundreds of photographs. Later I realised that, despite being there, enjoying my time and occasionally meeting friends, I was not truly in fiestas but was on the periphery. I was an outsider looking in, poking my lens towards a familiar world but staying right on the threshold. Even when I put the camera down to have a drink or to run I was conscious of being alone, being on a schedule and being being restricted. I came back from Navarra with some beautiful photographs and some nice memories but with a sense of having been on assignment rather than on holiday. The very notion of sharing almost hints at its own reward. Any modest event can be heightened by the multiplication factor of others having gone through the same thing. Mass participation events always seem to generate an incredible vibe or movement that far outstrips the quality contained therein, such to the point that people just want to be able to say that they were there. Not that there is anything wrong with solitude. Thoreau said; “I never found the companion that was so companionable as solitude.” The truth and purity of an experience holds its integrity far longer if not shared – it is less likely to be tainted by exaggeration, embellishment or downright dishonesty. This is because our experiences are both fragile and fleeting. From their birth they instantly growing, distorting and gradually moving away from us as we try hard to hold onto them, keep them fresh and not lose their value. We share them to try to maintain or even increase their value – ultimately to keep them alive. In our world of social media, instant data and the associated hunger to expand our personal brand, it is easy to share. Experiences fly around the globe in an instant, shrinking that world and allowing us to share on a phenomenal scale. And my, but we do like to share! We share updates of our every movement, our meals and every “funny” video uploaded to YouTube. We share philosophies, challenges and political viewpoints. We share our love, our hate and our indifference. The world is in a sharing boom, yet trawl through all of that data and what is its value? When you look back at the volume of content you have shared over the last 10 years or so, just how much of it is still alive for you in the same way? How much of it would you share all over again? “Visibility without Value is Vanity.” Bernard Kelvin Clive. I have shared a picture on social media a handful of times. It is a picture of me with two other friends on the opening day of fiestas in Tafalla, Navarra. We are wearing the traditional fiestas clothes, clutching drinks and singing our heads off. It is a wonderful image of a wonderful memory of a wonderful moment for me and I have obviously found it worth sharing more than once. Yet, the value is not in the sharing online as those who were not there cannot add to its value and those who were, already appreciate the value. What keeps that moment alive is the memory of the day itself and the warmth of the friendship that exists. “Even though friends say they are interested in your life, they never really want to talk about you as much as you want them to,” said Charise Mericle Harper, and this hints at the belief that sharing can be a law of diminishing returns – the true intrinsic value is only represented by the picture. Look at the works of the surrealist artist Rene’ Magritte – he challenged us to look at things and to assess what they truly are, what they truly mean, what they truly represent and ultimately if they are worth what we think they are. Something shared stays alive in its purest form for only a short time and what follows is that desire to keep it alive. Truly we don’t do that online but in our hearts. A couple of years ago our small group was in Buñuel in southern Navarra. We were running a few modest encierros. One of my dearest friends, and one I go back to my first year in Pamplona with, was with me and we were running in a quiet section of the streets. The dice roll fell favourably, the Gods of the encierro smiled on us and we ran up the street almost side by side, the pack of horns closing steadily, but almost benignly and we stepped out of the way calmly and together as the herd shot up towards the church of Santa Ana. We didn’t need to go over the run in detail. The value was much more philosophical than that. It was a nice run and we had shared it in the moment. No amount of analysis would improve it. Racking up hundreds of “likes” on Facebook would not give it extra value. Holding it in our hearts with a smile would be enough to sustain it. There have been so many other trivial, short-lived, personal and fleeting moments, whimsical moments even, that I have shared in the 15 years of fiestas of Navarra, Spain and beyond. Imagine a time running down the street with a friend and singing the lyrics of a Rolling Stones song at each other. How do you share such a thing beyond the pair of you without somehow diminishing the true value? How do you explain the laughter gained from a comment in the moment, an atmosphere, a sudden piece of music, an amusing incident? Sharing is voluntarily given but also voluntarily received and while we can dictate the medium in which we launch our content, we cannot dictate how it will be interpreted. As Antonio Porchia said; “I know what I have given you…I do not know what you have received.” Often our good intentions will simply be met with ambivalence or worse, utter contempt. That is often the price of sharing. Sometimes the old ribald comment of “you had to be there,” is absolutely correct, so why try to breathe artificial life into something that has none? Somewhere in between the loneliness of solitude and the loneliness that drives over-exposure to the world through social media is where the true value of sharing sits. Only we can decide where that actually is, but perhaps the final judge is in reflection. Ultimately there is a beautiful joy in having shared something wonderful, but not over-shared it.